Learn more about the fundraising campaign that made this transformation possible. It’s safe to say that autumn is upon us -- temperatures are dropping and we’ve even seen a little rain. These tell-tale signs of fall not only make it a popular season, they are also the same reasons why fall is the best time to plant and, at the newly renovated UC Davis Good Life Garden, that is exactly what’s happening. What happened to the prior landscape? Since 2008, this garden, located in the courtyard of the Robert Mondavi Institute for Wine and Food Science, was a popular venue for high-profile events thanks to the gorgeous, ever-changing edible landscape. Then, a little over a year ago, to prepare for an innovative rainwater harvesting project, many of the edible demonstration planting beds were removed. What makes this landscape different? Those concepts included reestablishing a landscape as stunning as the one that preceded it, designing it to require less water and maintenance, building in student leadership and learning opportunities and showcasing the academic departments that surround the garden. To define the areas earmarked for student learning, Parker reserved all the garden’s raised planting beds for her edible landscaping interns. The students will soon fill the beds with a plethora of cool season crops including multiple varieties of broccoli, kale, lettuce and swiss chard which, upon harvest, will go straight The Pantry– a student-run service providing basic necessities for students. The remaining in-ground beds will be filled with lower-maintenance perennial edibles including herbs that also serve to attract pollinators. In these areas Parker is planting thyme, oregano, pineapple guava, stevia, rhubarb, artichoke, chamomile, dwarf varieties of lavender and more. UC Davis Campus Landscape Architect, Christina DiMartini Reyes, created the premier Good Life Garden design for its grand opening in 2008 and offered Parker tips on making her selections fit the surrounding terra cotta orange building color. “Christina advised me to sparingly use plants that bloom in pastel colors and focus on hot colors including reds, oranges, and yellows, then opt for blues or purples. Next, Parker plans to add additional trees to the Good Life Garden’s small but mature orchard. “Given the impact the Department of Food Science and Technology has had on the California almond production, we’d be remiss if we didn’t include at least one,” says Parker. They are well on their way! Arboretum and Public Garden staff, community volunteers and students will be busy planting the area throughout fall and encourage community members to visit, see their progress and find inspiration for their own ornamental edible and/or low-water landscapes. 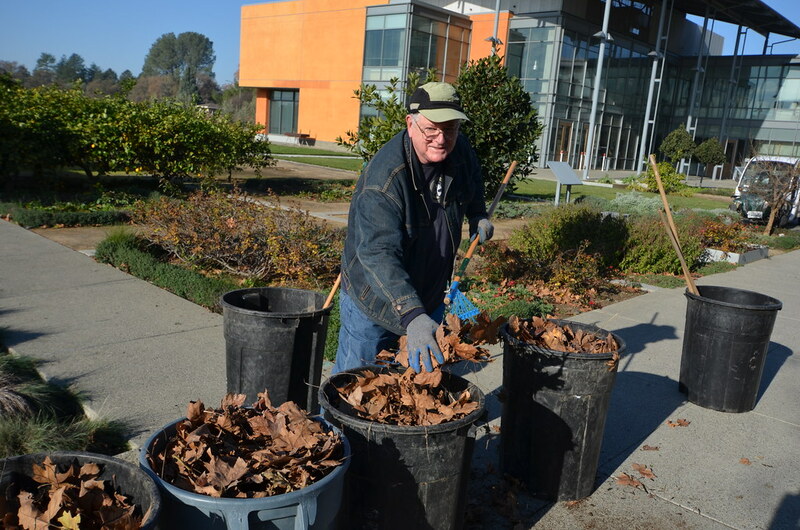 In the meantime, most of the same or similar perennials, herbs and edibles planted here will also be available at the Friends of the UC Davis Arboretum and Public Garden’s plant sale on Saturday, October 13.